One of the best ways to improve your score is to select the correct club for the yardage, and assuming you hit that club your normal distance, you’ll be putting for a birdie. Right? However, if you have played this game for any length of time you know that’s one of those statements falling into the easy-to-say-hard-to-do category. The big problem of course is the inconsistency of results when we swing a golf club. Everyone who has ever played golf experiences it so all we can do is take more lessons and send additional time on the range knowing perfection will never be attained. However, you still need to know the distance to the target and laser range finders provide it with absolute accuracy and are not dependent on signals from orbiting satellites. 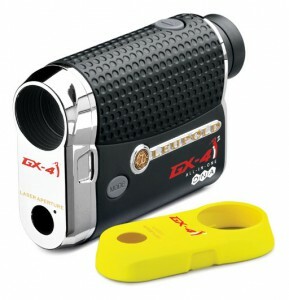 Which brings me to the Leupold GX-4i² laser rangefinder. From the first, even taking it out of the box, it was evident this is a quality product, rugged and well-made. Over the ten rounds of this trial that fact was confirmed time and again. Distances are given to one-tenth of a yard, way more accurate than my game but none the less comforting and I liked the “fog” mode which helps for targeting pins when you have one of those early morning tee times. The GX-4i² also has compensations to help you with the “plays-like” distance based on your inputs for altitude and temperature and there’s an inclinometer to judge the effect of slope on your shot. 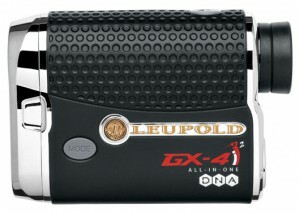 What makes the GX-4i² unique though is the ability to link all of these and, after you have input the distance you hit your 4-, 6- and 8-irons, the unit will suggest the correct club for the distance compensating for the effects of elevation, temperature and altitude. And the best thing is the system works. Anecdotally, an uphill par-3 on my home course has a fairly severely pitched green angling from back to front. Using the GX-4i² I found the correct club for a front pin location was one more than would be called for just judging by the yardage. No surprise there but to a back right pin the club needed was two more than the yardage because of the slope. It may sound elementary in the retelling but it still was a pleasant surprise to me. Finally the USGA rule that allows laser rangefinders does not allow use of ones with all of the GX-4i2 features such as the inclinometer so Leupold provides two face plates. A bright yellow one with a microchip to give all the described distance compensations and club selections plus a chrome faceplate without the chip, making it in compliance with the USGA rule. So if you want the best and will makes use of the yardage compensation features the GX-4i² at $625 is a great choice, conceivably the only choice.